A proposal announced Thursday by state health and education officials calls for two new vaccines for school children and requires a shorter time frame for their administration. The Pennsylvania Department of Health and the Department of Education announced Thursday a joint proposal to revise immunization regulations for school children. Health Secretary Karen Murphy and Education Secretary Pedro Rivera said this week they want to better protect students’ health by requiring students to finish all immunizations within the first five days of school. If guardians fail to complete that schedule, a written note from a doctor outlining the plan to immunize the student must be submitted to school officials within the first five days of class. Currently families have up to eight months to make sure school children have their vaccinations. The proposed changes also call for two additional vaccinations, a pertussis vaccine and an additional dose of the meningococcal vaccine to be administered prior to entering 12th grade. Murphy said the goal is to increase immunization rates in the state’s children and to promote “herd immunity” — verifying a large population is immune to a disease — “so that we don’t have unnecessary exposure to communicable diseases,” she said. Pennsylvania’s immunization rate for MMR (measles, mumps and rubella) in students K-12 currently sits at 91 percent, while over half of U.S. states report MMR vaccination rates above 95 percent, which is the target percentage for achieving herd immunity, according to Murphy. Rivera said it is the responsibility of educators provide children with a safe learning environment. In order to be adopted, the proposal must go through the state’s Advisory Health Board and State Board of Education, which could take up to two years to complete. State Sen. Shirley Kitchen of Philadelphia is worried that children in Pennsylvania are not getting immunized against preventable illnesses simply because they don’t have access to the shots. The Democrat has introduced Senate Resolution 27, which would mandate the Advisory Committee on Public Health Law of the Joint State Government Commission undertake a study of the issue. Dental fixes are getting quicker as schools, private practices and the military add new in-office technology to create replacement teeth and crowns. 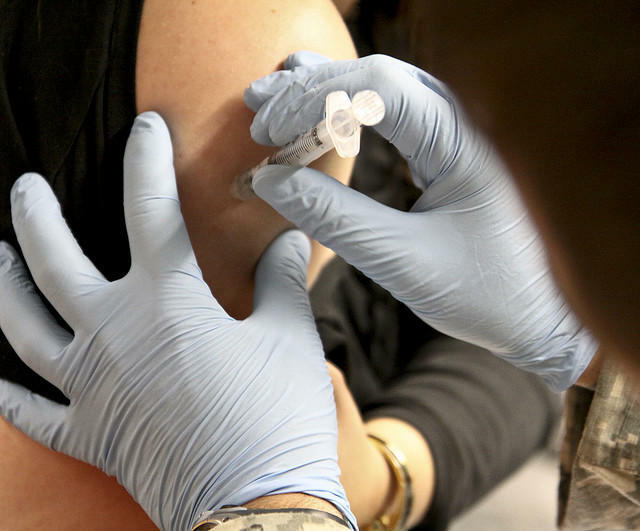 The Centers for Disease Control and Prevention predicted this year’s flu vaccine would be “much better” suited to fight circulating strains of the flu virus, according to Marc Itskowitz, an internal medicine physician at Allegheny General Hospital. “So far it looks like [the virus and vaccine] will be well matched, and that usually means the efficacy rate will be better,” Itskowitz said. He added, however, that vaccines’ effectiveness can never be truly predicted. No longer are pharmacies the corner soda shop drug stores of the past. Modern pharmacies and drug store chains have expanded their role from prescription outlets to alternative venues for medical treatment. According to business contributor Rebecca Harris, many drug stores are going above and beyond their traditional roles by offering immunizations and flu shots for all ages throughout the year. She says because they deal with prescriptions daily, pharmacists often know more about the latest medical trends than doctors and can be a valuable partner for consumer health. Pennsylvania Secretary of Education Pedro Rivera was an engineering major in college – for one semester. Allegheny County is one of four sites nationwide to be chosen for a new initiative aimed at improving health throughout the county. The Bridging for Health: Improving Community Health Through Innovations in Financing initiative will have the health department working with the nonprofit Robert Wood Johnson Foundation to simplify and strengthen the links among different health-related areas, according to Karen Hacker, Allegheny County Health Department director.